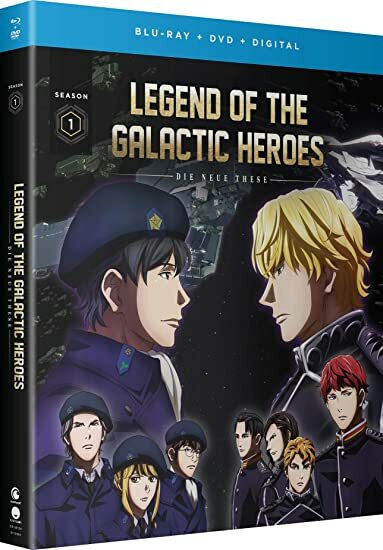 Legend of the Galactic Heroes: Die Neue These - Season One - BUY THIS BLU-RAY! Legends collide in the enthralling reboot of this classic space drama!Caught in a 150-year-long war, interstellar nations reach the pinnacle of strategic combat at the hands of two genius leaders. Reinhard of the Galactic Empire, and Yang of the Free Planets Alliance lead the charge from opposing fronts. Fighting is their destiny, but in this vast universe torn by political intrigue, their greatest enemy may not be each other. THEN SEND IN A COMMENT ABOUT YOUR FAVORITE FUNIMATION TITLE (you may click on artwork above for a refresher) PLUS YOUR NAME AND ADDRESS TO contests@efilmcritic.com or WeLoveHBS@aol.com. (Just one e-mail please.) Put [b]"THESE NEUE NEED TO DIE" in the subject line and cross your fingers. We will draw names and one of the prizes could be yours. Only 1 entry per household.